There are plenty of agreements that you may make throughout your lifetime. But if the party with whom you form the agreement does not fulfill his/her obligations, or fulfills them in an unsatisfactory manner, does the law afford you any recourse? It depends – is there even a contract in the first place? Assuming that all the requirements above are met, then the agreement is a valid contract, and legal recourse may be sought in the event of a breach. How to determine a breach of contract? What does it mean to breach a contract? A contractual breach does not only include a complete failure to perform one’s obligations. It may occur so long as the performance is not up to the standard that could be reasonably expected of the party e.g. if it is performed late. To determine if a breach has occurred, it is thus necessary to first determine the exact obligations that the contract created. Obligations that are laid out explicitly in the contract are known as express terms. These are generally straightforward, though the courts may sometimes have to interpret the meaning of these terms to give effect to the intentions of the parties. In addition to express terms, however, the court may sometimes find a party in breach of terms that were not explicitly agreed to by the parties. These terms are known as implied terms. Essentially, what the court is doing here is reading in additional terms into the contract. The main rationale for doing so is to ensure that the contract makes commercial sense e.g. if A contracts to set up a marquee for B’s wedding, there is a clear implication that the task will be completed in time for the wedding, even if this is not explicitly stated. Some implied terms are automatically included into all contracts of a particular type e.g. the Sale of Goods Act makes it such that in all contracts involving the sale of goods, it is implied that the goods will be sold in a reasonable condition. Importantly, however, implied terms generally cannot contradict express terms. This is because doing so would infringe upon the parties’ freedom to contract in a manner of their choosing. The more specific the wording of a contract, the less likely that such issues will arise. Once the obligations under the contract have been ascertained, a breach can be determined to have occurred as long as either party fails to perform any of their obligations to the standard required. It is not always necessary for a breach to have actually occurred before one can file a legal claim. As long as evidence can be shown that one party intends not to honour his/her obligations, the innocent party will be afforded similar protection and remedies as if the breach had occurred. These are known as anticipatory breaches. An anticipatory breach can be shown if there is express communication by the defaulting party that they do not wish to fulfill their contractual obligations. Alternatively, it may be inferred through actions taken by the defaulting party that would make fulfillment difficult or impossible (but this is heavily dependent on the facts of the case). What if the defaulting party has an excuse? The fact that a breach has occurred (or can be anticipated to occur) does not automatically guarantee a legal remedy. If the defaulting party has a lawful excuse for the breach, he/she will be able to escape any penalties. The first possibility is that the alleged breach is provided for in the terms of the contract. Parties can and often do include clauses that exclude their liability for certain breaches e.g. A contracts to deliver B’s goods, including an exclusion clause that he will not be liable for any damage that occurs along the way. Another example is a termination clause, which allows a party to withdraw from the contract entirely without incurring liability, so long as certain conditions are met. We may think of such clauses as conditioning the obligations imposed by the contract, such that no breach has occurred in the first place. Even if the breach is not provided for in the contract, there are rare instances where the defaulting party may not be held liable. This is known as the doctrine of frustration, which applies when an unforeseeable event beyond the control of either party has occurred e.g. A contracts to groom B’s prized cat, but before this can be done the cat is run over and killed. The rules governing frustration are found in the Frustrated Contracts Act (Cap 115, 1985 Rev Ed). If the defaulting party can point to any lawful excuse justifying its breach of contract, this will provide a valid defence against any legal claim. What if the defaulting party does NOT have a valid excuse? Remedies for the innocent party. Assuming that a breach has occurred and no defence is available, then the innocent party will be afforded a legal remedy. However, there are a range of remedies available that can be applied in any combination. The specific remedy to be awarded in each case is a matter of judicial discretion. It is important to remember that the purpose of imposing legal remedies for a breach of contract is to place the parties, as far as possible, in the position they were in before the breach occurred. Generally, they are not meant to punish the defaulting party; instead, they are merely to compensate the innocent party to the extent of the loss caused by the breach. The most common and default remedy is that of damages. Damages refers to monetary compensation awarded to an innocent party for losses incurred as a result of the breach. This might include any loss of expected profit or additional expenditure borne by the innocent party. For example, if A contracts with B to supply a component needed in B’s product, but delivers them in a defective state, A may be liable not merely for the cost of the defective component but also any expenditure incurred by B to replace the components and any loss of profit caused to B. When it comes to calculating damages, however, the court expects the innocent party to take all reasonable steps to minimize the loss caused by the breach. If the innocent party incurs additional losses by not taking reasonable steps after discovering the breach, this will not be included in the damages. Taking our previous example, assuming B discovers that the component A supplied was defective, but continues to sell its product anyway, the additional loss of profit from returns and complaints will not be included in A’s damages. These are fundamental terms of a contract, non-performance of which is grounds for termination. A contract may expressly define certain terms as being conditions, while certain statutes e.g. Sale of Goods Act may also designate all terms of a particular type as being conditions. Even if not expressly deemed as such, the court may consider factors such as the intentions of the parties and standard industry practice to determine if a term is fundamental enough to be deemed a condition. These are less important terms of a contract, non-performance of which only entitles the innocent party to damages, not termination. If an innocent party terminates a contract for mere breach of a warranty, they may, in turn, be liable for a claim of wrongful termination. 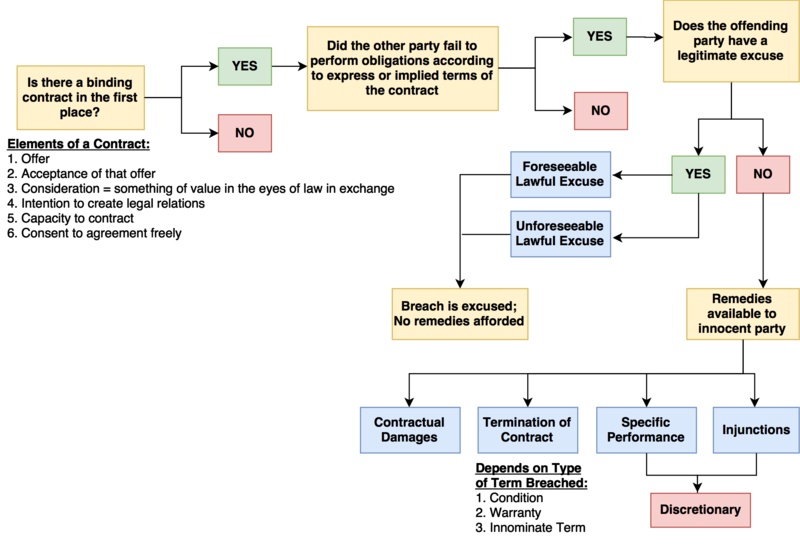 Even if the right of termination is available, the innocent party can choose to continue the contract regardless, while still claiming damages for the breach. The following remedies are discretionary in nature, have more requirements than those above, and are (comparatively) more rarely awarded. This is because of their history as equitable, rather than common law remedies (the distinction is no longer of much relevance). In some cases, damages will not be sufficient to bring the parties to the position they were in prior to the breach. For example, A is an expert watch-smith and contracts with B to make a watch only he can make. A then makes a defective watch. The provision of damages to B does not satisfactorily place the parties in the position they would be in if no breach had occurred, since B cannot get anyone else to make the watch. In such cases, the courts may compel A to carry out the obligation in full. This remedy is known as specific performance. Sometimes, the contractual obligation that was breached is a negative one. This means that the parties have contracted not to do something e.g. A contracts with B, promising not to dump toxic waste from his chemical plant onto B’s farm. If A continues to do so anyway, damages will not be satisfactory for B. The court can thus impose an injunction, prohibiting A from continuing his actions. Trying to figure out whether you have a case? Is the agreement a legally binding one? Has there been a breach of the obligations under that agreement? Does the defaulting party have a lawful excuse? What remedies are you seeking to claim? Have a question on Contractual Disputes? If you have a legal question about contractual disputes, you can get a Quick Consult with Kah Hee or other lawyers. With Quick Consult, you can check out in minutes and for a transparent, flat fee of S$49, the lawyers will call you back on the phone within 1-2 days to answer your questions and give you legal advice. 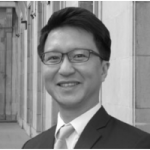 This article is written by Lau Kah Hee from Derrick Wong & Lim BC LLP and edited by Tessa Sim from Asia Law Network. My product has a copycat. What should I do?